The Department of Energy’s Energy Information Administration has reneged on a downward revision it issued in the June for its 2013 average diesel price projection, inching its projected price back up 4 cents to $3.92 in the year, according to the Aug.6 issue of the EIA’s Short Term Energy Outlook. That number, however, is still 5 cents lower than 2012′s average price. The EIA has downwardly revised its forecast for 2014, though, projecting that a gallon of diesel next year will average 16 cents less than the 2013 price — $3.76. 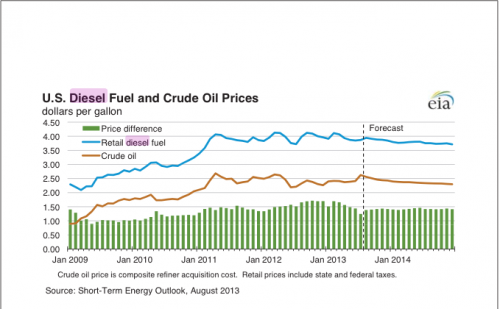 Increased consumption and an increase in crude oil prices in July are what drove the EIA’s 2013 forecast higher, the Outlook says. Crude oil production in July averaged 7.5 million barrels per day — the highest average in a month since 1991. The EIA projects that crude oil production will average 8.4 million barrels per day next year. Click here to see the full STEO.